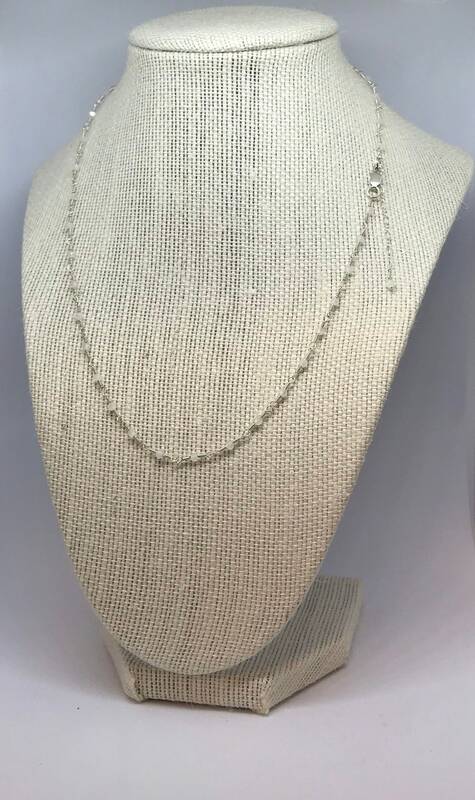 This beautiful and delicate Moonstone wire wrapped necklace was created with 2x3mm faceted rondelle moonstone beads and Argentium Sterling Silver. The necklace measures 18 inches long with a 2 inch extender chain. Because of the smaller bead size this is a delicate necklace that would be suitable for a young lady as well as an adult. My gemstone chain necklaces are very labor-intensive, it takes approximately 4 1/2 to 5 1/2 hours to make one necklace because of the intricacy used in creating these pieces. Argentium sterling silver is a silver material produced to a higher standard than traditional sterling silver, .940+ or 97% silver. Argentium silver is revolutionizing the way in which silver is manufactured and appreciated in the 21st-century. • Deionized water may stain due to the low pH factor so be sure to immediately dry Argentium silver to prevent staining. All pieces are shipped wrapped for gift giving. I am in love with this special pendant and necklace. The moment I saw it I knew it was made for me. It is beautiful made and dainty but grounding at the same time. This seller was very sweet and shipped this to me right away. She also sent me free jewelry polishing cloths. I can’t wait to purchase more from her thank you. I’m absolutely in love with my new pendant! Excellent quality and super fast shipping! California residents will be charged State sales tax as my studio is located in California. All of my listings are already made and will ship out in 1 to 2 business days from receipt of order. I use USPS for all domestic shipping and transit time is usually 2 to 5 business days. I can only ship to the address you provide at checkout and I am not responsible for shipping errors due to incorrect address entries by the buyer. Tracking information is available for all domestic packages. How safe is my billing and personal information? Your purchase transaction is completely safe and secure through Etsy. I don’t see any personal, billing or credit card information. What if I need to return an item for a refund? If you are not satisfied with your purchase please contact me directly through Etsy within three days of receipt regarding your desire to return an item. When you contact me I will give you a Return Authorization Number (RAN) so I’ll know to expect your package. When I receive your package in it’s original condition and packaging I will issue a refund.